It’s always taken a bit of persistence and planning to save money on the things you buy, whether it’s religiously cutting coupons from the newspaper or saving up frequent flier miles. Last year, NPR reported on avid e-coupon collector April Englebert, who told Weekend Edition that she saves up to 80% using online coupons. But over a year later, it’s now easier and easier to save money online – thanks to sites like Savings.com and GroupOn, as well as social networking sites like FourSquare and Yelp. There are various models for online coupons. GroupOn provides limited-time deals that visitors sign up for using their local zip code for services like yoga studios, spas, and restaurants. Savings.com aggregates deals from national chains and online retailers. FourSquare and Yelp provide money-saving incentives for sharing information about places you’ve visited. I spoke recently with Savings.com’s community manager Sara Dunham. She talked about the kinds of deals that people tend to search for online. Dunham said that employees at Savings.com are even required to use the available coupons to book their work travel. But Foursquare promotes it as a way to discover new places to eat, shop, etc. based on what your friends say they are doing. Here’s where the Foursquare Day part comes in. Some businesses are getting in on the game by saying if you “check in” on Foursquare today at their establishment during a certain time, you can get a deal. The privacy concerns about online coupons go beyond the information you may provide for the FourSquare and other social social network deals. The New York Times reported on the information stored in the barcodes of online coupons and when consumers may want to be wary. 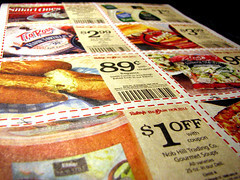 Using coupons to link Internet behavior with in-store shopping lets retailers figure out which ad slogans or online product promotions work best, how long someone waits between searching and shopping, even what offers a shopper will respond to or ignore. Have you used online coupons to save on goods or services? What kind of deals have you received? This entry was posted in Econstory, NPR: Aggregated Local News Feed, NPR: Local/National Collaboration, PRX: Public Radio Archive, Public Interactive and tagged coupons, groupon, internet, savings, savings.com, stations, wlrn on April 21, 2010 by Laura Hertzfeld.